As an event organiser you might want to offer special discounts or entry terms to members of a group. In RiderHQ, you do this by setting up a group and associating it with your event. You might also want to offer discounts for entry, or membership discounts to entrants who are currently members of a different group which is 'affiliated' to your first group. First click the 'add new affiliate group' button on your group's homepage. Enter your discount at the top, then either select your group, if it's present in the list, or put in details of who runs the group below. 'Who runs the group' would normally be whomever should be in charge of judging whether somebody is a member of the group 'in real life' or not - in the case of a club this might be the membership secretary. However, it's enough just to put in the name of your contact at the club/group, as they will be able to invite others to administer the group, if they need to, later. You can put yourself in as the owner of the group, though if you don't in fact run it, this may create more work as you will have to manually approve each 'member'. If you're not sure who to put in here contact us. 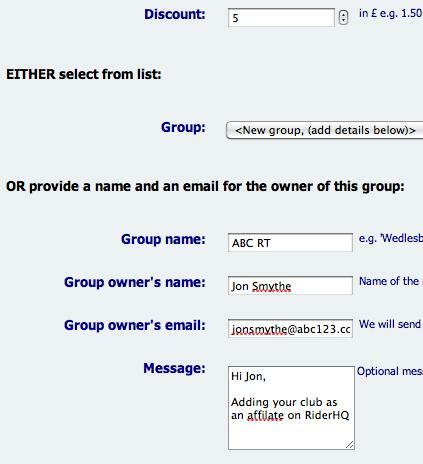 Once you save the form, members joining your group will automatically be able to select the 'affiliate' group from a list and will receive the membership discount that you specified. Their membership will be verified with the group owner before the discount is applied. Then enter the 'affiliate discount'. This will automatically be applied as above: the entrant will receive the discount once their membership is confirmed by the affiliate group's owner. Also, once they are confirmed as an affiliate group member they will automatically receive the discounts in future.